I guess everyone knows how important user engagement is. It takes a credit for increased pageviews, content consumption, user retention, low bounce rates and many more positive changes on your website. Keeping in mind the benefits it can bring, caring for better user engagement should be the prior concern for you, if you are serious about having a successful and trustworthy website. While engaging completely unknown people that visit your website seems not an easy task, there are luckily certain WordPress tools to help you to achieve it. So, there you have it 4 WordPress tools, for bettering user engagement on your website. It doesn’t matter whether you keep a photography blog, news website or a kind of an online diary, I’m pretty sure you’ll have a lot of visuals to share with your target audience. And that’s awesome! Images and other visuals are a great source for user engagement. They have the potential to attract visitors and keep them on a page way longer, than they initially have intended. If you want to take advantage of the images you have on your website and display them in beautifully presented galleries and portfolios, then Portfolio Gallery theme is the right solution for you. It’s an advanced WordPress portfolio theme for displaying media galleries and portfolios in different customizable layouts. You can even showcase the collection of your website posts as a gallery on your home page. It’s actually a great way to draw visitors to your posts and engage with the material you provide. Portfolio Gallery theme features a powerful lightbox, which is able to provide a short preview of the posts and show the enabled data/info for images and other media within it. The lightbox is also capable of showing your collections as a slideshow with 15 slide effects. The theme includes a highly customizable widget area, and also enables you to adjust all of its settings to best fit your needs. Watch the theme demo to get a full understanding how great the theme is. Another efficient way to increase user engagement is to show your visitors relevant content. This will increase the time visitors spend on your website and contribute to more content consumption as well. The best possible way to achieve it, is to get Yet Another Related Posts plugin for your website. My favourite thing about it is that you don’t have to choose the relevant content manually, the powerful algorithm of the plugin can do it automatically. All you have to do is to specify the “relatedness” options and there you go. You can select the matches to consider when generating relevant content, such as titles, headings, tags, categories, bodies and set the weight of each one in the provided options. It introduces not only relevant posts but also pages and custom post types. You can choose to display the related content in the list or thumbnails views, or take full control over how your content is displayed by selecting one of the templates stored in your website theme. A feature that I found to be very useful is the option to specify the minimum matching thresholds, so that in case you don’t have enough relevant content, less relevant or irrelevant materials will not be displayed. I’ve personally observed that posts and pages containing more images and different kind of media are better at engaging readers. It’s true, because all of us like looking through photos, watching videos and slideshows. If you think your posts lack the desired user engagement, try using WordPress Instagram Feed WD plugin. This WordPress Instagram plugin will bring user and hashtag based Instagram feeds to your website and make a great contribution in increasing user engagement of your posts. You can display integrated feeds in Masonry, Thumbnails, Blog Style and Image Browser views, which are sure to attract a lot of attention. Almost all settings of the layouts are customizable, enabling you to show the available image info such as likes, comments, description, hashtags, user data and bio. You can choose to sort images by likes, comments, dates or randomly. Upon clicking on the image, the visitors can be redirected to the image Instagram page or it can open the image in a lightbox. The most standout feature of the lightbox is its ability to display integrated images as a slideshow with 15 eye-catchy transition effects. Also, the plugin provides advanced conditional filtering option, which allows you to filter out images based on the specific hashtags, username, mention, description and Instagram media links. I really liked the two themes, that the plugin comes with, but was glad to find out I can also add new personalized ones. I recommend checking out the plugin demo, if you want to know more about it. User engagement usually takes place as your readers interact with the content you provide, but you can make it better if you allow the visitors interact with each other as well. The best way to make it happen is to try out Subscribe to Comments Reloaded WordPress plugin and see the results it brings. It’s a great plugin that enables your website commenters subscribe to the comments they have left under your posts, and get immediate notifications about the subsequent replies and comments. They can choose to subscribe to only the new comments or new replies, or not subscribe at all. 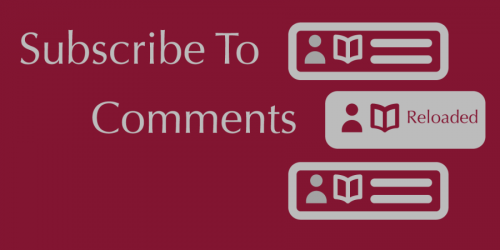 Moreover, your readers will be able to unsubscribe from the comment threads at any time they’d like. The options for customization of the plugin are various and advanced. You can choose how the subscription checkbox looks and manage the text within it. You can also customize plugin notification options to best fit your readers’ needs. Actually, the plugin is very useful and will not let your commenters miss any discussions around the posts and topics they are interested in. If you are looking for tools that would help you make user engagement better on your website, you can take your pick from the suggested products.These WordPress tools are of high quality and do a great job in engaging readers.It doesn’t matter what kind of a website you own, you can freely implement them and see them bringing amazing results right a way. If you have any questions or suggestions related to the article, feel free to ask me in the comments. I’d love to hear from you. Author Bio: Gayane Mar is a passionate web-blogger who started her blogging activity a few years ago. Her posts are all about web design and web development. She writes all these posts for good people who need some guidance or advice with web development. The driving force behind her writings is the great hope that her blog posts would be helpful for each and every one reading them. If you are interested you can follow her own blog wpcapitan.com.